Bradford Council is undertaking a programme of works to maintain and improve the building as one of Bradford's key heritage venues and cultural attractions, a building which has been an integral part of Bradford's landscape since 1853. Bradford Council and Bradford Theatres were notified today that they will be awarded £1.5 million to embark upon a programme of redevelopment works to make significant improvements to the building. In the 21 years since HLF was created over £40m has been invested in Bradford, thanks to National Lottery players. The cumulative impact of this latest project, on top of HLF’s previous investment, will provide a huge boost to the regeneration of the city. 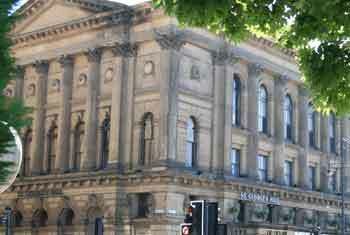 The St George's Hall Project plans to restore the sandstone exterior of the landmark Bradford city centre building and make other external and internal improvements to preserve heritage features and enhance the venue. As well as physical improvements to the building, the project will make archive materials about the history of the Hall more accessible and develop stronger links with the local community through an outreach and access programme. A permanent archive display will be created, including key events from the official opening in 1853 to the big rock and roll band concerts of the 1970s and 1980s. Past appearances have included famous names such as Charles Dickens, Harold Houdini, Dr Livingstone, Sir Edward Elgar, Queen, David Bowie and Motorhead. Also announced today was initial support for a £1.7m award to Keighley Bus Museum Trust for a project to establish a transport museum, and secure the long-term future of the unique exhibits and collections. "This is great news for Bradford. We’re delighted that, thanks to National Lottery players, we’ve been able to support this much-loved venue, building on the success of over £40m of Heritage Lottery Fund investment in Bradford. We’re very pleased that more people will be able to enjoy one of the oldest operating concert halls in the UK, as well as learning more about its fascinating history." "It is a significant result to have been awarded this sum from the Heritage Lottery Fund, recognising the cultural and historic importance of St George's Hall. We now begin an extremely exciting period of refurbishment and development which will result in a much improved venue re-opening next year." "When St George's Hall re-opens in 2017, we look forward to welcoming audiences to a venue which will still maintain all the character and wonderful acoustics that makes St George’s Hall one of the UK’s premiere concert halls and entertainment venues. There will be updates about how the work progresses at St George’s Hall via our website and other social media channels." "We're delighted that the Heritage Lottery Fund has given us this support. We've worked hard with them to demonstrate that this funding is needed to make St George's Hall a success. It’s great news that this historic venue is getting the investment it needs to maintain its position as a key heritage building and international venue. These plans will help us to reach new audiences and enhance everyone’s experience of live entertainment at this much-loved city centre venue." St George’s Hall hosts a wide range of professional events from children's shows to music of all kinds and the best in stand up comedy as well as community events, graduation ceremonies, speech days, talks and meetings. The Hall also programmes one of the country's longest running orchestral subscription season and is renowned for its excellent acoustic qualities. The venue will now close for approximately 12 months for the works to be carried out and will re-open in 2017.